Edinburgh, Oct 25 A US hunter attracted fierce criticism in Scotland for posing with a dead wild goat killed on Islay in the Inner Hebrides. "Such a fun hunt!! They live on the edge of the cliffs of the island and know how to hide well. We hunted hard for a big one for 2 days and finally got on this group. Made a perfect 200 yard shot." 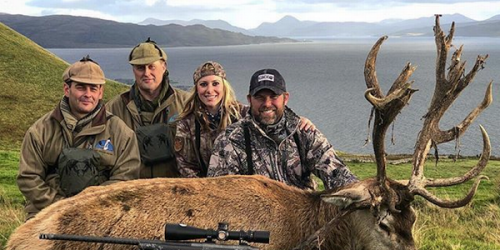 Switlyk also posted photos of another goat, a ram, and a red stag killed during the Scotland hunting trip, sparking outrage from many online and calls to limit trophy hunting in the Hebrides, reports CNN. Judy Murray, mother of the Scottish tennis player Andy Murray, called the hunt "disgraceful" and urged the government to stop similar events taking place. The backlash gathered steam on social media on Wednesday, soon prompting a reaction from lawmakers. Michael Russell, member of the Scottish Parliament, which includes the island in question, said he would raise the hunt with the government "as a matter of urgency". Scottish First Minister Nicola Sturgeon said the government "will review the current situation and consider whether changes to the law are required". The National, a Scottish newspaper, splashed Switlyk across its front page on Thursday, with the banner headline "GOAT HUNT FURY". Numerous American hunters have sparked outrage worldwide for posting photos of wild animals killed on controversial hunting trips in Namibia and other African countries, CNN reported. Both sons of US President Donald Trump, Donald Jr. and Eric, are big-game hunters. Don Jr. has been photographed holding a severed elephant tail after a hunt in Zimbabwe and has reportedly lobbied to reduce limits on trophy hunting in the US.